In recent years, substantial progress has been made in exploring and exploiting the analogy between classical light and matter waves for fundamental investigations and applications. Extending this analogy to quantum matter-wave optics is promoted by the nonlinearities intrinsic to interacting particles and is a stepping stone towards non-classical states. 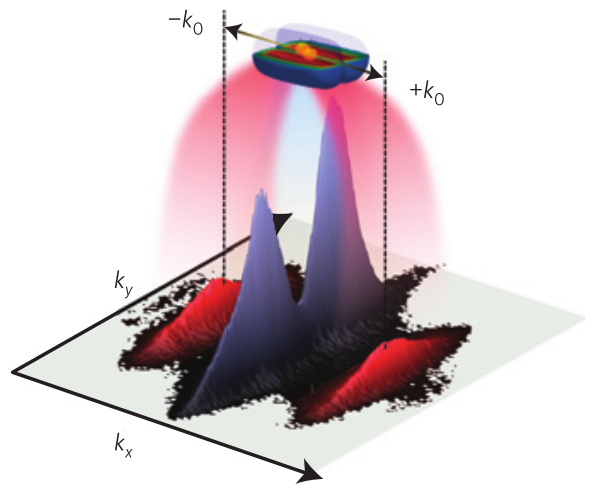 In light optics, twin-photon beams are a key element for generating the non-local correlations and entanglement required for applications such as precision metrology and quan- tum communication. Similar sources for massive particles have so far been limited by the multi-mode character of the processes involved or a predominant background signal. Here we present highly efficient emission of twin-atom beams into a single transversal mode of a waveguide potential. The source is a one-dimensional degenerate Bose gas in the first radially excited state.We directly measure a suppression of fluctuations in the atom number difference between the beams to 0.37(3) with respect to the classical expectation, equivalent to 0.11(2) after correcting for detection noise. Our results underline the potential of ultracold atomic gases as sources for quantum matter-wave optics and should enable the implementation of schemes previously unattainable with massive particles. Robert Bücker, Julian Grond, Stephanie Manz, Tarik Berrada, Thomas Betz, Christian Koller, Ulrich Hohenester, Thorsten Schumm, Aurélien Perrin, and Jörg Schmiedmayer. Nature Physics 7 (2011): 608.
for the peculiarities arising formatterwaves: significant depletion and explicit time dependence of the source state population, long interaction times, and spatial dynamics of the amplified modes.We apply our model to explain the details in an experimental study on twin-atom beam emission from a one-dimensional degenerate Bose gas. Robert Bücker, Ulrich Hohenester, Tarik Berrada, Sandrine van Frank, Aurélien Perrin, Stephanie Manz, Thomas Betz, Julian Grond, Thorsten Schumm, and Jörg Schmiedmayer. Dynamics of Parametric Matter-wave Amplification. Physical Review A 86, no. 1 (July 2012): 013638.